Firebreaks can be quickly constructed through heavy brush and small trees. Only one pass was required to make this firebreak. Only two passes over the same ground were required to make this firebreak. With an additional pass, shredded wood and vegetation may be tilled into the soil to further inhibit the spread of fire. 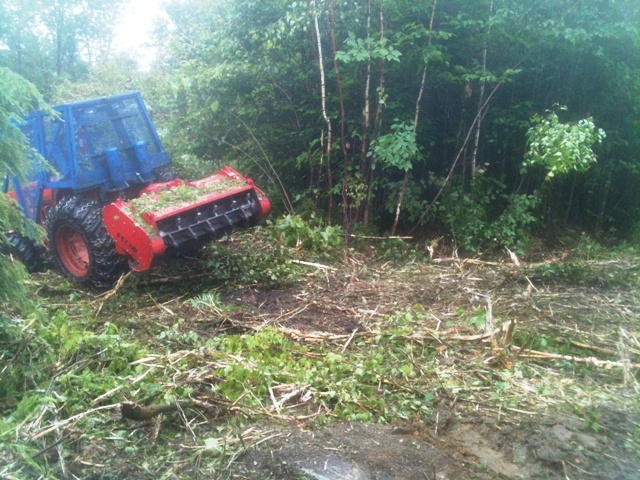 Firebreak construction through dense saplings - after the first pass. 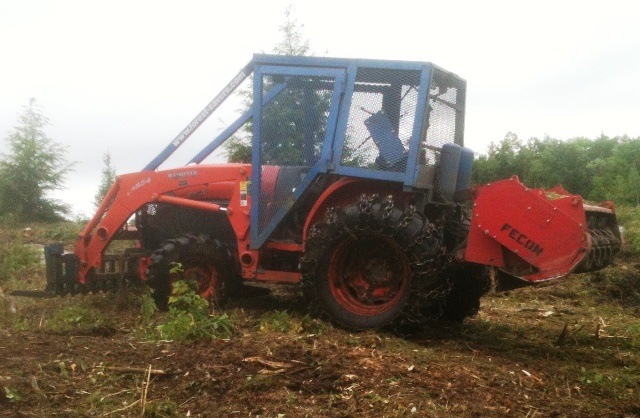 The Forest Savers machine can cut and shred unwanted trees up to several inches in diameter, yet is small enough to maneuver around and between trees to save. Rocks do not dull or damage the shredder. The heavily shielded, 4-wheel-drive tractor with brush clearing rake on the front and severe duty shredder on the rear can penetrate thick brush and negotiate difficult terrain. The quick attach forks and/or tongs can be added to the clearing rake on the front making it even more efficient for moving logs and debris. The tractor may be quickly driven between sites or trailered behind a 3/4 ton pickup.